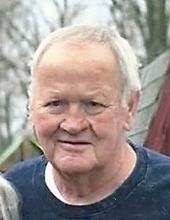 Terry Alan Trotter, Age 72, went to be with his Lord and Savior Jesus Christ on February 3, 2019. Terry passed peacefully at home surrounded by his wife, kids, grandkids, great grandkids and sisters. Terry was born July 15, 1946 to Arville "Doc" and Magdalene "Pat" (Jones) Trotter in Columbus, Indiana. He married the love of his life, Burnetta Lewis on July 29, 1967. They were happily married for 51 ½ years and were married at the Reddington Christian where he was a member. Terry was a graduating member of the Class of 1964 at Seymour High School. Terry worked at Cummins Engine Company for 31 years. In January of 1968, he took a leave from Cummins to serve in the United States Army. He served from January 1968 to December 1970. During this time in the military, he was stationed in Baumholder, Germany. Terry retired from Cummins in 1995. Shortly after, he got a job at the Seymour Elks Club in maintenance. He always loved mowing his yard and that was the perfect part time job for him. He loved all the people he worked with both at Cummins and the Elks and remains friends with many of them to this day. Terry is survived by his loving wife Burnetta. His three daughters: Angie (Kevin) Blewett, Tina Oliger, and Nikki Hercamp. His grandchildren: Alan Trotter, Zach Trotter, Justin Walker, Jimmy (Stacy) Walker, Shannah (Ricky) Dalton, Steven Hercamp, Alisa Rose Trotter, Jacob (Hailey) Oliger, Chloe Clark, and Jeremiah Oliger. His great grandchildren: Kali Dalton, Jeremiah Oliger, Jerika Oliger, Jace River Oliger, Jayleigh Oliger, Lynnie Oliger, Jersey Oliger, and Gannon Cornett. His sisters: Pat Ingram and his precious twin sister Tammi (Bob) Kleber. He wants everyone to know Tammi was older. Terry had many nieces and nephews who he loved. Terry also had many close friends who cherished the time they spent with him. Lastly, Terry had his dog Nala Bean who is missing him dearly. There are so many things we could say about our precious daddy. He was someone who wanted everyone to succeed. When he told you he was happy for you, he genuinely meant it. He loved family gatherings, watching his kids and grandkids play sports, and listening to the Gaither Gospel Hour on Saturday nights. He would sing at the top of his lungs even though he couldn’t carry a tune. Dad lived his life right. He loved his family with all his heart. He was the fill in dad for so many and for that we will forever be grateful. He worked hard and he always gave everyone the benefit of the doubt. Terry was preceded in death by his parents, brother Tommy, his mother and father in law, Dan and Elsie Lewis and his great granddaughter Jenna Alexis Oliger. To send flowers or a remembrance gift to the family of Terry Alan Trotter, please visit our Tribute Store. "Email Address" would like to share the life celebration of Terry Alan Trotter. Click on the "link" to go to share a favorite memory or leave a condolence message for the family.